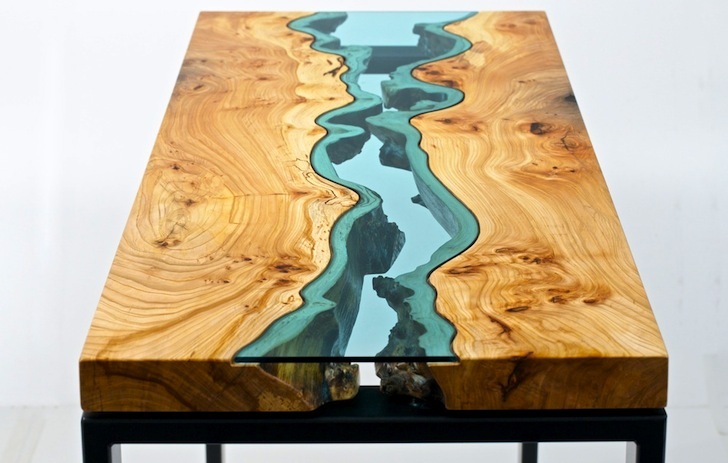 Furniture maker Greg Klassen brings the beauty of the Pacific Northwest indoors with the River Collection, a series of incredible reclaimed wood tables embedded with glass pieces that evoke crystal clear lakes rivers and lakes. Klassen sustainably sourced the wood for the tabletops from the banks of the Nooksack River, which flows below his studio in Washington. Made mostly from salvaged walnut or maple, each furniture piece celebrates the wood's unique character by leaving the natural grain, holes, and edges intact. From coffee tables to large conference desks, Klassen’s handcrafted furnishings all include a brilliant inlay of blue-green glass. For most of his pieces, the hand-cut glass is used to merge two live-edge slabs together and mimics the appearance of a meandering river. The polished wood set on either side of the glass become the riverbanks, and the natural lines of the grain allude to topographic shapes in the landscape. While most of Klassen’s pieces consist of rectilinear edges with a river-like glass inlay, he has also explored other shapes such as his Cedar Lake Table created from the cross section of a Western Red Cedar with a lake-shaped glass sheet set in the center. The supporting legs have a minimalist design are are usually constructed out of powder-coated steel, bronze, or plexiglass. I'm a sustainability graduate and I can tell you that when an LCA (life cycle analysis) is conducted on wood v plastic. Plastic looses every time. Period. It may (MAY!) be an exception if a large (but still growing*) tree is cut down in Northern Russia and posted to the South of New Zealand. Transport miles using a fossil fuel etc. *young growing trees take more CO2 out of the atmosphere than well established mature trees. Plastic is a by-product of petroleum(oil) and metal is mined. It takes millions of years to create oil and ore. Which is more damaging to the environment, oil production and mining, or harvesting trees that can regenerate in a few decades? Too many 'plastic environmentalists' that think out of their posteriors, instead of with their brains. And Paige, you assume. There are many trees that come down of their own accord - who are you to know that these are not of them? Considering the very first para uses the words "reclaimed wood". You really need to get a grip on reality. These are stunning pieces of art that are designed to last past my lifetime as well as yours and as such leave a lot less impact on an environment than almost all other types of furniture. Such exquisite workmanship doesn't need comments like yours. Clearly the 2 people who previously commented live in plastic houses and have never used paper or a pencil.. get over yourselves! I think these are amazingly beautiful works of art that I could only dream of having the chance to own! HOW, exactly, is the designer daring to claim environmental responsibility when using beautiful virgin hardwood? These trees were CUT. This isn't pallet furniture, or recycled from old construction. I'm sure massive hardwood pieces like that claimed a steep price from both the designer and the forest that lost the tree. You cut sooo many trees for these models and show us beauty? :-( very sad. Completely Dislike. For most of his pieces, the hand-cut glass is used to merge two live-edge slabs together and to mimic the appearance of a meandering river. From coffee tables to large conference desks, Klassen's handcrafted furnishings all include a brilliant inlay of blue-green glass. The polished wood pieces set on either side of the glass become the riverbanks. The natural lines of the grain allude to topographic shapes in a landscape. Most of Klassen's pieces consist of rectilinear edges with a river-like glass inlay. 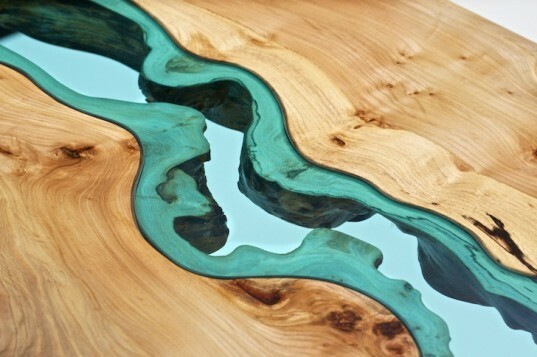 Klassen has also explored other shapes such as in his Cedar Lake Table, which was created from the cross section of a Western Red Cedar with a lake-shaped glass sheet set in the center. The supporting legs sport a minimalist design and are usually constructed out of powder-coated steel, bronze, or plexiglass. Klassen sustainably sourced the wood for the tabletops from the banks of the Nooksack River, which flows below his studio in Washington. Much of the wood is either made of maple or walnut. Klassen celebrates the timber’s unique character by leaving the natural grain, holes, and edges intact. Each furniture piece is one-of-a-kind. The circular pond table stands on powder-coated steel legs.